Sitting in church one Sunday morning with his wife, David Krabbenhoft leaned forward in his pew, intrigued by his pastor quoting H.L. Mencken: For every complex problem, there is a solution that is simple, neat and wrong. In that moment, Krabbenhofts thoughts didnt turn to religion or philosophy, but instead to something else very near and dear to him. I leaned over to my wife, and I said Karen, thats my mercury story, right there, he recalls. For the past 15 years, Krabbenhoft, a geochemist and project leader for the U.S. Geological Survey (USGS) National Mercury Project, has had mercury on the brain, all the time  trying to understand how the toxic metal moves through the atmosphere and reacts in the environment, eventually making its way into the food web. Its a bit of hydrology, ecology, chemistry and microbiology all rolled up in a complex package  a true study in biogeochemistry. He and others are hoping to find a right, albeit complex, solution to the complex problem of mercury pollution. With mercury emissions reductions coming up in policy decisions both here and abroad, his research has taken on new relevance and urgency. Mercury is a neurotoxin that bioaccumulates in the food supply, posing a risk to people and wildlife that consume fish. According to the Environmental Protection Agency (EPA), mercury is the leading cause of impairment in U.S. lakes and estuaries, with 49 states issuing more than 2,600 fish advisories for mercury in 2001. Recent reports from EPA, the National Wildlife Federation and the United Nations all warn of the large anthropogenic increases of mercury in the air and water and the potentially harmful effects it can have on humans, especially pregnant women. Cindy Gilmour and Ken Sandilands take sediment cores in Experimental Lakes Area Lake 658 in September 2001, following a mercury isotope addition. The sampling is part of METAALICUS, a large, multi-investigator experiment to test how mercury affects an ecosystem. Photo by Georgia Riedel. About 8 percent of women of childbearing age in the United States have potentially harmful levels of mercury in their bodies, according to the Centers for Disease Control and Prevention. That amounts to about 320,000 babies born annually at-risk for neuro-developmental delays. Evidence also points to the potentially severe effects of mercury accumulating in the tissues of wildlife that eat fish. USGS laboratory experiments have shown that toxic mercury decreases the survival rate of California Clapper Rail eggs and substantially affects the endocrine systems of fish in the Everglades. Under the Clean Air Act, EPA is aiming to cut mercury emissions by more than 90 percent from two of the largest sources, municipal waste combustion and medical waste incineration. But the largest source, coal-fired electric power plants, has no federal emissions standards; only Connecticut has state emissions standards. The fact that so many states have advisories out limiting fish consumption because of mercury concentrations has had a huge impact, and indicates that we have a problem out there despite having controlled other sources of mercury emissions, says Jim McCarthy of the Congressional Research Service, who has been following legislation in the 108th Congress to reduce mercury emissions. EPA plans to issue a proposed rule on Dec. 15 to regulate emissions from power plants, an action 10 years in the making. In the meantime, however, the Bush Administration is pushing its Clear Skies Initiative to limit mercury emissions. Clear Skies aims to build on the 1990 Clean Air Acts Acid Rain Program using a cap and trade system to achieve the proposed reductions for sulfur dioxide, nitrogen oxide and mercury, replacing more than a half-dozen specific regulatory programs for electric power plants. Over the first four years of the Acid Rain Program, sulfur dioxide emissions from the largest, highest-emitting electric utilities were about 5 million tons below 1980 levels, according to EPA. A cap and trade program, in the case of mercury, sets a national cap on how much utilities could emit  26 tons in the year 2010 and 15 tons in 2018, McCarthy says. The economic program would allocate allowances to facilities, so that if they emit more mercury than they are supposed to, they can buy allowances from other facilities that have controlled mercury more. The idea behind trading is that some facilities might find it cheaper than others to control emissions, he says. Clear Skies also relies on reducing mercury emissions as a coincidental benefit of reducing other pollutants. Five other bills are also in the works in the House and Senate. Most of them would set facility to facility standards and do not allow trade, McCarthy says. The other legislation, critics of Clear Skies are quick to point out, also would reduce mercury emissions more and faster. Sen. Jim Jeffords (I-Vt.) bill, for example, would cut mercury emissions by more than 90 percent, to a total of 5 tons by 2008. Policy makers do not know how much of a reduction in mercury emissions from coal-fired plants will result in a lower risk to the fish-consuming public, and whether a reduction in the United States would help the ecosystems here. Thats where David Krabbenhoft comes in. He thinks that making effective policy decisions regarding mercury emissions requires a better understanding of its cycling through the environment. Part of that, and key to current legislation, is learning how much of the mercury in fish is from current human emissions and not past sources. During an interview over lunch in the U.S. Senate cafeteria one wintry February afternoon after he presented the latest on mercury research to staffers for the 108th Congress, Krabbenhoft remembers how he began investigating mercury. It was 1988 and mercury was all over the newspapers in Wisconsin, his home state. The taxpayers in Wisconsin wanted to know why our northern Wisconsin pristine lakes had so much mercury. Where was it all coming from? he says. So, on his first day at USGS, he wrote a proposal to study mercury in temperate lakes. It would be the first of many such studies. Mercury was long thought to be a point-source pollutant from industrial and mining wastes. Inspiration for Lewis Carrolls character the Mad Hatter in Alices Adventures in Wonderland came from the strange behaviors displayed in the 1800s by people working in the felt hat industry. Constant exposure to mercury nitrate eventually caused the hatters to develop mercury poisoning and neurological disorders. Although mercury is no longer part of the felting process, its industrial legacy remains in the environment. Once in sediment, mercury becomes very stable, locked up with sulfur and immobile in the absence of dredging or some large erosive event. One of the largest legacy sources, Krabbenhoft says, is from the California Gold Rush of 1849. Gold miners used mercury to extract gold from the ore, leaching mercury into the environment where it has remained trapped in sediments. But even this mercury is slowly mobilizing out of the Sierra Nevada Mountains. Still, the mercury of the moment, whats on most peoples minds, comes from the air. Fifteen years ago, no one had any idea that the mercury in the Wisconsin lakes was all coming from the atmosphere, Krabbenhoft says. Thats all changed, he says, with a number of multi-investigator studies, including Krabbenhofts in Wisconsin. Now, researchers and the public know that mercury also rains down from a number of places; Wisconsins taxpayers know that the mercury in their water originally came from the air. Natural sources including volcanoes, geothermal springs and geologic deposits emit mercury to the atmosphere, as do human-related sources, such as coal combustion, waste incineration, industrial uses and mining  all totaling about 7,260 tons per year of mercury. An ice core collected from the Freemont Glacier in Wyoming shows wide variations in mercury emissions over the past 275 years, Krabbenhoft says. But overall, mercury releases since the industrial revolution dominate the core history, accounting for 70 percent of the deposited mercury in the past 100 years of the record. Save a volcanic eruption in Tambora, Indonesia, in 1815, mercury concentrations in the ice core for the last 100 years far exceed the prior 100 years. The last ten years of the ice core record have shown a distinct decline in atmospheric mercury, but, Krabbenhoft says, researchers are still unsure why (read sidebar). delivery to lake water. Photo by Cindy Gilmour. The path mercury takes from a source to eventual deposition is complex. Three different species of mercury travel through the atmosphere at different time scales. Elemental mercury (Hg0) circulates for up to year before depositing on land or in water, while ionic (Hg(II)) and particulate (Hg(p)) mercury deposit within a relatively short distance to their sources. After deposition, the mercury works its way into the sediments. Once the ionic form of mercury settles in sediments, sulfate-reducing bacteria can take the mercury, which has formed a complex with sulfur, and convert it into methylmercury. Thats the potent neurotoxin that accumulates in fish tissues and continues through the food chain, until it reaches humans and other animals that eat fish. What is still uncertain are all the steps, on the small scale, that need to occur for the mercury to both get into the sediments and to then become methylmercury. Also uncertain is the timing of those reactions and how the rate of reaction varies between newly deposited mercury and legacy sources. If it is the current sources of mercury that are reacting in the environment and not the legacy sources, Krabbenhoft says, reducing mercury emissions now could potentially reduce the amount of mercury accumulating in fish. Distinguishing the recently deposited atmospheric mercury from the legacy mercury is key to understanding how a reduction in mercury emissions would change the risks posed by consuming fish. Thats what METAALICUS, the Mercury Experiment to Assess Atmospheric Loading in Canada and the United States, sets out to do. 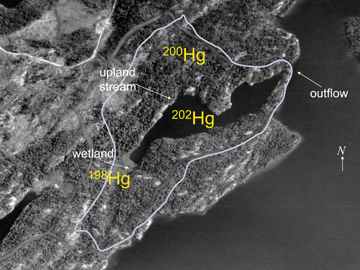 Adding stable isotopes of mercury to an experimental lake in Ontario, U.S. and Canadian researchers from several universities and research institutions have been able to follow mercurys path through the system. The Canadian government allowed the study in the Experimental Lakes Area (ELA)  providing 30 years of expertise and baseline data on the local ecosystem. There may be no place on earth that this study could be done other than the ELA, says Cindy Gilmour, a biogeochemist and microbial ecologist at the Academy of Natural Sciences, Estuarine Research Center in Maryland. The ELA has a history of large lake-manipulation experiments, such as the phosphorous addition experiments of the 1970s that turned one-half of an experimental lake green. The experiment showed the concept of eutrophication, or over-fertilization. ELA experiments in the 1980s largely focused on acid rain, and then the area moved on to metal studies, including mercury and METAALICUS. METAALICUS investigators add different mercury isotopes to different parts of the watershed of Experimental Lakes Area Lake 658 in Ontario, putting mercury-202 in the lake, mercury-200 in the uplands and mercury-198 in the wetland. By simulating natural mercury loading to a North American watershed, they are able to follow each isotope as it moves through the system. Image by Condy Gilmour. 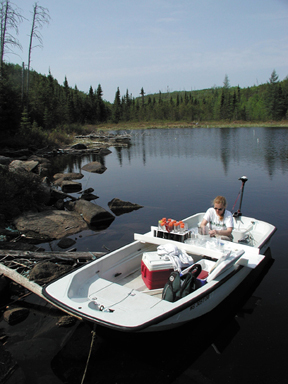 After a couple of years of preliminary studies, the METAALICUS investigators began adding different mercury isotopes to different parts of the watershed of ELA Lake 658  mercury-202 in the lake, mercury-200 in the uplands and mercury-198 in the wetlands  to simulate natural mercury loading to a North American watershed. For the purposes of the study, all other forms of mercury detected in the ecosystem are from old sources. Its a three-year experiment, with the final addition this year. The total amount added barely fills a teaspoon yet it costs half a million dollars to acquire and is enough to change the load to the ecosystem by a factor of four to five, Gilmour says  showing the incredible toxicity and bioaccumulation potential of the metal. Mercury deposition generally follows patterns of acid rain deposition, so the highest rates of mercury deposition in the United States are in the heartland and in the southeast and northeast. With the stable isotopes, were basically increasing the deposition of the system from what they currently get in northwest Ontario to what we get here on the East Coast, she says. Methods for putting the isotopes down onto the system vary for each part of the ecosystem. In the lake, they just divvy up the isotope into 15 different bottles and dribble it out slowly about half a meter down, to reduce escape to the atmosphere. They add it at night so that the mercury can mix down before sunrise the next day. For the uplands and wetlands, the story is different. There, a professional spray pilot from the Canadian Forest Service comes out in May and waits until the perfect, rainy conditions. The reason the isotopes go on in rain is because the suns not out and it comes down in rain anyway so that mimics natural conditions. And also, the rain helps to wash it through the canopy so that were not spraying a very fine mist on the leaves thats going to evade the upland, Gilmour explains. No matter what, some will escape the system  about a 30 percent loss from both the lake and the uplands. Canadian law requires the research team to monitor the water quality of Lake Winnange, which is about a thousand times bigger than the experimental lake that feeds into it. Fortunately the lake is a slow-moving system, where it takes about three years for a particle of water to leave; most mercury is retained in the sediment. We couldnt do it in a fast-moving lake, Gilmour says. The results of the experiment have been diverse, and are still in the works. So far, the mercury in the upland and wetlands has stayed put, with less than 1 percent of the mercury from the upland making its way to the lake. Theres this time lag between when the mercury comes into the ecosystem and when its mobilized into the lake that we never would have known without the isotopes, she says. Theres at least a two-year lag time before the mercury that rains down on the canopy gets to the lake. They do not know yet just how long, because the isotopes have yet to show up. In this cold, arboreal forest, the summer is short, and it could be that the leaves have to rot before the mercury begins moving through the system, Gilmour explains. the newer mercury is at least five times more readily methylated than the pools of legacy mercury, she says. As the mercury ages, it becomes less and less available to microbes for methylation  which means that the current emissions from coal-fired plants have a major effect on how much mercury is in the food supply now, Gilmour says. Until more time has passed, though, the researchers will not know how much the mercury added to the uplands and wetlands affects the food web, or in what time frame, Krabbenhoft says. All I can say after two years is that we have hardly seen any of the mercury we put onto the uplands in the lake. Our hypothesis is that mercury landing on the uplands needs to mature, if you will, work its way deeper into the soil horizon before it becomes mobilized. But even then, the mercury might be pairing itself with dissolved organic carbon complexes, making it unavailable to the methylating microbes; but, Krabbenhoft says, they still dont know. The final year of the mercury-addition experiment and the next few years analyzing the resulting data will prove useful in helping researchers determine the analogs in a natural system. While the Canadian experimental lake serves as a surrogate for watersheds everywhere, Gilmour says, it is important to look at ecosystems elsewhere to extrapolate. METAALICUS and another project in the Florida Everglades called ACME, which looks at the mechanics of methylation and its relationship with sulfur and dissolved organic carbon, are changing the face of mercury studies and giving researchers views at both the small and large scale. Other projects are underway or starting up in San Francisco, New York and Wisconsin. Krabbenhoft is also involved in studying mercury gradients in urban areas, and the relationship between where the mercury comes from and where it deposits, looking at the footprints of individual power plants in any given area. These small-scale studies could hint at global geographic relationships. The argument not to regulate mercury emissions could rest on either: theres so much mercury already out there that reducing emissions isnt going to make any difference, or that the United States only emits a relatively small amount of the global emissions that we wouldnt make a dent, Krabbenhoft says. Indeed, the United States only emits 6 percent of the total human-related mercury globally; Asia accounts for more than 48 percent. Whether or not we reduce emissions in the United States, we need to know more about how our emissions contribute to our local contamination, he stresses. Its not as simple as totaling up world emissions and looking at which piece of the pie we represent. But, regardless of relative magnitude, local emissions do contribute substantially to the local problem, he says. Georgia Riedel works with sediment cores in the wetland end of Lake 658 in June 2003. Photo by Cindy Gilmour. While it seems nothing is simple in the world of mercury research, looking back on the past two decades, some things are becoming abundantly clear, says Krabbenhoft, finishing up his lunch at the Senate. If we more universally in the world move toward reducing mercury emissions, we will see different positive impacts among ecosystems, he says. Although some ecosystems will experience more of a positive effect than others, and many of those details are still uncertain, Krabbenhoft is certain that reducing mercury emissions will reduce the contamination of fish in U.S. watersheds  and its not going to take millennia to get a response. Thats the message he hopes the congressional staffers received from his presentation. Decisions in the near term are going to need to rely on either the scientists gut instinct or go on blind faith, he says. Even if decision makers dont know the exact amounts by which to reduce emissions, at least they will know that a reduction of any amount can and probably will make a difference. An ice core from the Freemont Glacier in Wyoming reveals a marked decline in atmospheric mercury over the past 15 to 20 years and researchers have not known exactly why. Now, new research published in the May 22 Geophysical Research Letters appears to support this trend, showing a sharp drop in gaseous mercury in the atmosphere since its peak in the 1980s, a drop three times higher than previously thought. Changes in the international industrial landscape may well be responsible, says lead author Franz Slemr of the Max Planck Institute for Chemistry in Mainz, Germany. The communist regimes in the former Eastern Bloc collapsed around 1990, and the economy of the involved countries changed. One of these changes was the partial replacement of the old coal- based energy supply to a modern oil-based energy supply, Slemr explains. The notoriously poor energy efficiency improved, with old power stations retrofitted with technologies to clean exhaust, thus reducing mercury emissions. Additionally, mercury use in batteries decreased. There are good reasons to believe that anthropogenic mercury emissions decreased substantially. But because of the lack of data we do not know either the size of the total change or the individual contributions of the processes, he says. The data behind this observed trend comes from direct atmospheric mercury measurements (both manual and automatic) at six sites in the Northern Hemisphere, two sites in the Southern Hemisphere and eight transatlantic ship cruises since 1977. Put together, the sites show a consistent picture: Atmospheric mercury concentrations increased in the late 1970s to a peak in the 1980s and then decreased to a minimum in about 1996; concentrations have been nearly constant since. The 17 percent decrease in mercury concentrations corresponds to a 34 percent decrease in anthropogenic emissions, assuming that natural emissions and re-emissions of the historically deposited mercury have remained constant. That does not exclude the possibility of changes induced by, for example, climate change. But such changes would be expected to have much smaller gradients, a few percent per decade at most, Slemr says. The observed large changes in atmospheric mercury concentration suggest not only that human-made emissions are a major source of atmospheric mercury, but also that emission controls work, Slemr says. But, their data also reveal the deficiencies of current global mercury inventories. The size of the concentration decrease suggests that the ratio of anthropogenic to natural sources is probably much larger than assumed before, Slemr says. Past studies have estimated a one-to-one ratio of human-made to natural emissions. Slemrs team hopes that their research will prompt improved emission inventories and a better understanding of the mercury cycle. Pinsker is managing editor of Geotimes.